This year's sold-out event was held in Hostelling International (HI) NYC's lovely ballroom that served as the perfect event venue. I've actually never stayed in a hostel, but I was immediately a fan of HI. The property was gorgeous and not at all what I expected when I think of the word 'hostel.' I didn't have a chance to tour the rooms, but the common areas were lovely and well-maintained. To start the night, we enjoyed soft drinks, beer, and light snacks in HI's urban garden. After cocktail hour, Metanoya and I gave opening remarks (Jessica was there in spirit! ), followed by Sarah Greaves-Gabbadon's (otherwise known as JetSetSarah) keynote address. Each attendee received gift bags with items from Caudalie, and had an opportunity to win an 4-day, 3-night vacation package to the U.S. Virgin Islands, a 1-night stay at the National Harbor with passes to ICE! and the Capital Wheel, and a gift card to Cocotique. Amazing prizes, if I do say so myself! If you're in the travel industry, you're familiar with JetSetSarah. She's tiny in stature but big in personality and overall, just a very lovely and spirited person. It was a pleasure hearing her speak on being a women of color in the travel industry. Sarah said she felt there was no better person to tell the stories of the Caribbean than her, which is the focus of her travel writing and brand. She made note that until recently, she did not see people who looked like her doing what she did. Some days it feels like she has 10 bosses as a freelance writer, and she has to prove herself to them every time, a sentiment that many people of color have in their professional careers. Sarah offered inspiration to travel media saying, "Use your gift. Be brave and don't wait for others to show you your gift." She said, "If no one else is going to open up doors for us, we have to band together and bust that door down!" Following JetSetSarah's amazing speech, our panelists took the stage, including Kimberly Wilson (Travel Writer and Social Media Manager for The Grio), Yvonne Pearson (Tourism Marketing Coordinator at National Harbor), Keisha Nelson (Account Executive at USVI Tourism), Imani Rodman (PR Executive at M Booth) and Diana Limongi (Founder of DLG Media). Moderated by Felice Léon (Host at The Root), each panelist spoke of their experiences as women of color in travel media. 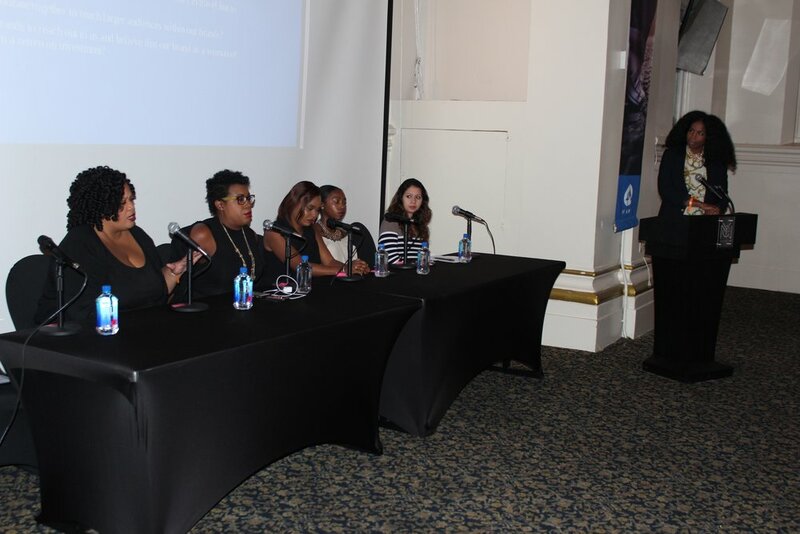 Panelists reflected on how women of color can make our voices heard in the travel space and get brands to recognize us as influencers, how we can use our media to inspire other women of color to travel more, and how tourism boards and public relations firms can target women of color to promote their brands. During our inaugural event last year, I blogged about how there are plenty of women of color travel bloggers, they are not being included as much as they should in travel media. I still stand by those remarks. I see bloggers on major press trips and women of color travel bloggers are hardly ever included. Our perspectives are different than our white and male counterparts. I left #WomenofColorTravel more inspired than ever to continue the mission of Will Drink For Travel. While my blog is not targeted specifically to people of color, I hope to always be serve as a positive representation of women and black travel bloggers. The landscape of travel is changing and it's time for destinations and brands to take notice. Thank you to Hostelling International NYC for being such amazing and accommodating hosts. HI offers tourism scholarships for students and professionals 18-30 to change the world through a mission. Their goal is to get more people of various backgrounds to travel, which is noteworthy and much needed! Thank you to our sponsors U.S. Virgin Islands, National Harbor and Cocotique. We look forward to hosting this event again next year! Check out more photos from the event below. And if you missed Metanoya, Shannon Haynes (Parlour Magazine), Evita Robinson (Nomadness Travel Tribe) and me on The Grio discussing our experiences as women of color who travel, check out the video here. Newer PostWhy Don't More Black Americans Want to Visit Africa?